This weekend, I hosted a barbecue for two of the best guys in our business; Mike Krieger of Liberty Blitzkrieg and Daniel Ameduri of Future Money Trends. Like myself, Mike is a New Yorker and former Wall Street Energy analyst (he at Lehman Brothers, I at Salomon Smith Barney) who left the den of thieves to move to Colorado and join the “alternative media,” where he discusses a variety of topics from finance to civil rights to healthy living. As for Daniel, he was the face of the spectacular videos produced by the National Inflation Association in the early 2010s. However, when the site’s owners “went rogue” by shunning its raison d’etre of educating of the dangers of hyperinflation, Daniel created his own investor relations business, boasting some of the mining industry’s most well respected names as clients. Given how antagonistic the vast majority of Americans are to the concept of Precious Metals – or better put, ignorant, complacent, and clueless – it was a breath of fresh air to have them and their lovely families at my home; just as it is working each day at Miles Franklin, and communicating with the world’s “precious few” economic truth seekers. To that end, we have reached a period of market manipulation so severe – and blatant – it’s become impossible to ignore, even by the most conflicted establishment apologists. And nowhere more so than Precious Metals, where the chasm between paper and physical prices has never been wider, growing more so each day. Which, fortunately, will only expedite the inevitable “London Gold Pool-like” implosion of the Cartel, despite the very real possibility of destroying the vast majority of “paper PM investments,” as I have emphatically warned for the past four years. In fact, this weekend alone, nonsensical, “grave dancing” anti-gold articles reached a fever pitch, highlighted by Barry Ritholtz’s propaganda piece so egregious, you’d think it was written by Joseph Goebbels himself. Why do I bring this up? Because, especially given my dozen-plus years of association with GATA, I am the intellectual enemy of anyone that feigns free markets, whether for personal gain or due to plain old ignorance. Too much is at stake to pretend otherwise, and given admissions of market manipulation are as rampant as collapsing economic data and thieving global “leaders” (particularly relating to precious metals suppression), there’s neither a benefit nor a purpose in being diplomatic. As for “paper PM investments,” increasingly pervasive articles discussing their horrifying plights are, sadly, all too true – such as this one of a pending, massive strike in South Africa (can you believe the average South African miner makes the equivalent of barely $5,000/year, payable in a currency that this week plunged to an all-time low? ); and this one, of how in the current environment, there is “nothing that not on the table” in terms of closing mines, cutting costs, and doing anything to survive the historic (and likely, accelerating) worldwide plunge in commodity prices of all kinds. Other than Precious Metals – which unlike all others, are down not due to fundamental weakness, but TPTB’s intense fear – rooted in thousands of years of historical data – that history’s most infamous “barometers of bad tidings” will cast a damning light on their collapsing fiat Ponzi scheme. Of course, in their maniacal desire to hold “dollar-priced” gold and silver down, they have inadvertently caused prices in the world’s other 180-plus currencies to surge – particularly “commodity currencies” like the Canadian and Australian dollar; the Brazilian Real; the South African Rand; Indonesian Rupiah; Russian Ruble; and countless other fiat currencies, cumulatively used by billions of worldwide denizens. With each passing day, the evidence pointing to an imminent, comprehensive collapse in not only global economic activity, but the aforementioned, worthless fiat currencies underlying it, becomes increasingly obvious – to the point that there’s no way of pretending otherwise, which is why it’s so obvious that guys like Barry Rithholtz have an agenda, in publishing nonsensical statements like “the U.S. economy is improving, as are those of many other countries.” I mean geez, we are unquestionably at the singular low point of global economic activity of at least the past century – with the “only difference between late 2008 and today,” for instance, being the aforementioned, maniacal market manipulations, utilizing unprecedented “weapons of mass financial destruction” like derivatives and high frequency algorithms. Mathematically, for example, the odds of gold falling on 109 Sunday nights out of 111; or 487 of 554 opens of the London paper market at 2:15 AM; make those of a “sixth sigma” event pale in comparison – particularly in this case, as the very factors that caused gold to rise on Friday have since expanded dramatically. That said, the aforementioned laundry list of global economic horrors are but symptoms of the “great deformation” caused by four-plus decades of history’s largest, broadest fiat currency Ponzi scheme – which is why historically oversupplied commodities are destined to plunge far lower than most can imagine; other than, of course, the “anti-bubbles” in manipulated gold and silver, which will inevitably yield (and in some cases, are already), unprecedented supply shortages. This morning alone, commodity prices are in all-out freefall yet again, led by the very base metals (copper, lead, and zinc) whose production are responsible for half of all the world’s silver, given how it is principally a byproduct. Said commodity collapse – particularly in crude oil, which easily provides more revenues to sovereign governments than any other product – guarantees a cataclysmic, near-term acceleration of the current, unprecedented global economic collapse; which is why ridiculous propaganda like Ritholtz’ (“the U.S. economy is improving, as are those of many other countries“) is rapidly becoming anathema, and truth like the Miles Franklin Blog espouses increasingly embraced. 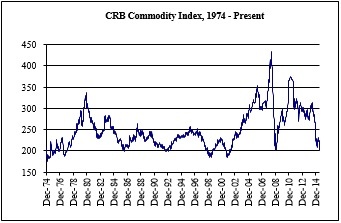 To wit, as I write the CRB Commodity Index has fallen to the “key round number” of 200 – down 2% from Friday’s close alone – having been lower on just two, extremely brief occasions since 1975; 1), in early 1999, when a “perfect storm” of anomalous factors caused oil prices to briefly plunge below $10/bbl (which I remember well, having been an oilfield service analyst living in New Orleans at the time); and 2) the immediate aftermath of 9/11. Sadly, this time is significantly different, as the reasons commodities are plunging are 100% fundamental in nature, and dramatically worse than at any time in U.S. history. And this, despite explosive Central bank money printing causing the nearly all commodities’ production costs to surge – which is exactly what David Stockman’s “great deformation” describes, and exactly what belies my unprecedented economic and financial bearishness. In the coming weeks and months, I have ZERO doubt that the 1999 and 2001 CRB Index lows will be sliced through like a knife through hot butter; and when they are, I cringe with fear as to what the world’s political, economic, and social landscape will become. And equally powerfully, anticipate unprecedented demand for the only assets that have proven to protect investors’ net worth from the ravages of hyper-inflationary monetary policy, physical gold and silver. Which, if that wasn’t enough, brings me to the “tell-tale sign that the end game is upon is” – per this article from, of all places, long-time MSM lackey Bloomberg, titled “Emerging Market Central Bankers are getting nervous about their plunging currencies.” Too bad they weren’t “nervous” about such a cataclysm when they should have been; i.e., when they allowed the U.S. to unilaterally disband the Bretton Woods agreement in 1971, sentencing all currencies to a future, spectacular collapse. Which sadly, is now, as the resulting, historic fiat Ponzi scheme moves through its cancerous terminal phase. As the article notes – espousing the previously “taboo” views the Miles Franklin Blog has emphatically spoken of for years – diluting currencies in “whatever it takes” fashion only makes things worse; to the point that today, many Central banks are being forced to raise interest rates to prevent their currencies from instantaneously collapsing. Which, amidst the aforementioned, historic global economic collapse – in which unprecedented, parabolically expanding debt levels have been built up – will only exacerbate the carnage; likely, in very short order. In other words, the “final currency war” is already proving to be a miserable, “99%-destroying” exercise in futility – as demonstrated, in spades, by the “poster child of QE failure” itself, Japan; where today, the Yen has fallen to a multi-decade low – along with the Japanese economy, and prospects for even surviving as a nation. Trust me, when even Goldman Sachs warns “there no end in sight to the weakness in developing-nation currencies,” it’s time to put your crash helmets on. And by the way, I just love how they try to pretend it’s just “developing nations” – as opposed to all of them – especially when the very same article refers to two of the so-called “BRICS,” Brazil and South Africa, as regards their horrifying currency collapses. In many ways, the article is as “Ritholtz-like” in its pro-dollar propaganda as it is dire in its currency and commodity forecast. That said, it unquestionably reveals the “tell-tale sign that the end game is upon us”; i.e., not only the global currency collapse we have long warned of, but Central banks’ inability to do anything but make the situation worse. It’s so bad now it is getting very scary. The bankers might as well go ahead and end the ponzi game because there is not much left to steal. They have stole so much the middle class has been wiped out and you CAN NOT maintain a “consumption economy” without a middle class. I still maintain that by Thanksgiving Day of 2015 things will be ugly and it will not be a happy time. It’s just sad what these crooks have done !!! Forgive the stupidity of this 83 year old grandmother, but this article was the last straw for me, and I need to understand just one tiny little thing. As mentioned in this article, we read again of those “paper PM investors”. What I don’t get, is the attraction and allure of the PAPER for these people–and why are they adverse to physical? I simply have never read an article or heard one human voice in this category explain themselves, and therefore, I am at a loss to even comprehend their mindset. Furthermore, as far as I know, the always interesting Mr. Hoffman, has never quoted anyone of this “caliber”. Hence, I cannot be either sympathetic or scornful of their viewpoint because their reasons for investing in paper PM’s are unknown to me! Most “paper PM investors” do so because they don’t understand the risks; and more importantly, the rigging. They also don’t get that gold and silver are savings/insurance, not speculations – and still believe miners/ETFs/closed-end funds to be “proxies” for gold/silver, despite mountains of evidence otherwise. I know New Zealand doesn’t register on the world stage with it being at the end of the earth and tiny with only around 5m people but check out the recent commodity crash (milk price auctions and farmer payouts – which underpin a significant amount of our economy), exploding house prices, NZ is around #3 on the unaffordability index, the recent fall in the NZD v the USD and the Reserve Bank of NZ (Central Bank) has reduced interest rates recently by 25basis points with another 50basis point reduction predicted before year end and maybe imminently. Gee, I wonder which way home prices will resolve. If you’re ever in western Va I’d love to host you and yours. You are a big part of why I’ve bought so much physical gold and silver in various forms over the last couple of years. I took it all out of the stock market. Perhaps I will, next time I’m there. Thanks so much! I’m seeing lots of road side signs for mid to low pay jobs ( things in the less than $20 per hour range) in fast food, truck and auto mechanics, some construction jobs too. Money velocity is definitely picking up on the low end of the economy. I can’t explain it easily other than the welfare state has kept many folks out of the workforce. Mall parking lots and restaurants are always busy. My guess is little savings is going on. Do you have any thoughts on this? I read some time ago that people tend to spend more during inflationary periods and give up saving for the future, taking on longer loan periods, eating out more often and basically spending available cash while extending future debt. Any explanation would be helpful. Not sure how to answer this, other than that a few anecdotes about road signs is hardly a trend. And it certainly is not enough to make judgments about monetary velocity. Commodities collapsing yesterday below the 2008 lows, and Friday’s lowest wage growth EVER, with a 50 year low in Labor Participation, are better over signals to me. And yes, nanny Sam has disincentivized people from working, thanks to unending printing press funded entitlements.